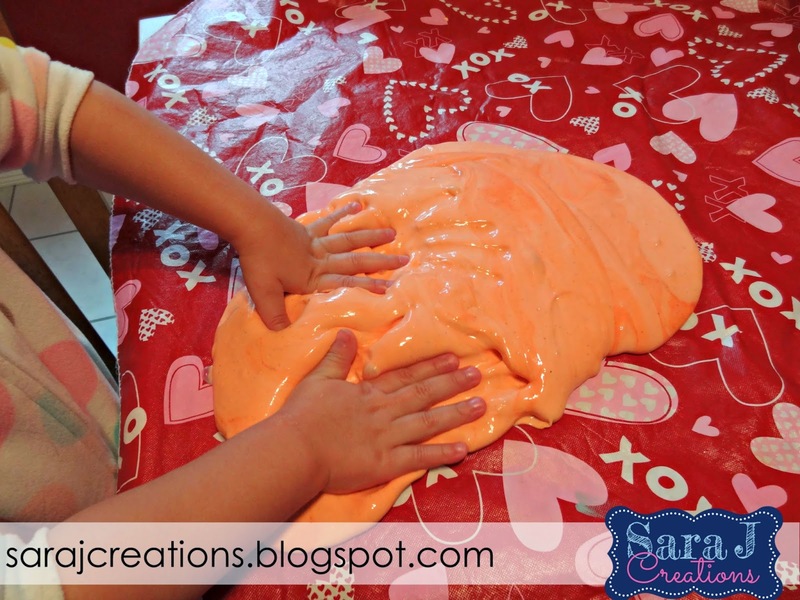 I found THIS recipe on Pinterest for Pumpkin Pie Silly Putty and knew I wanted to try it. 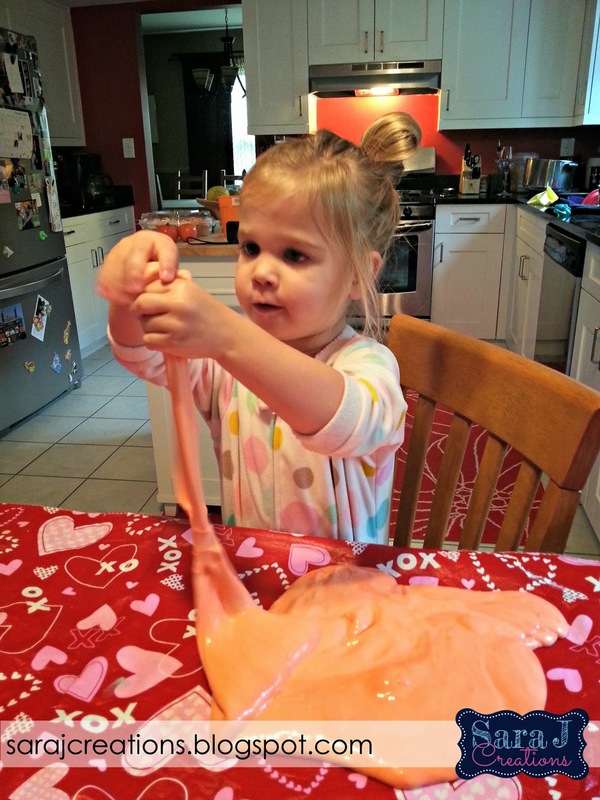 I've seen lots of different slime recipes but have never tried any with my girls. I've read some articles that children shouldn't use products that have Borax. And then other articles that say it is fine. I don't know what is right but I figured I would give it a try and make sure to watch K carefully so she didn't put it in her mouth and I wash her hands after she plays with it. I'm so glad I tried this recipe. K absolutely LOVES it. It was so weird to watch it go from a liquid to a goopy sort of solid. We will make snakes with it and form letters and then after a little while it almost melts and spreads out. So fun to play with and pretty clean. It sticks to itself and easily comes off of little hands. It doesn't come off of clothes/material (like K's jammies) as easily but when I washed it, it came out with no problem. Sorry I didn't have many great pictures. The lighting wasn't so great the day we did this. 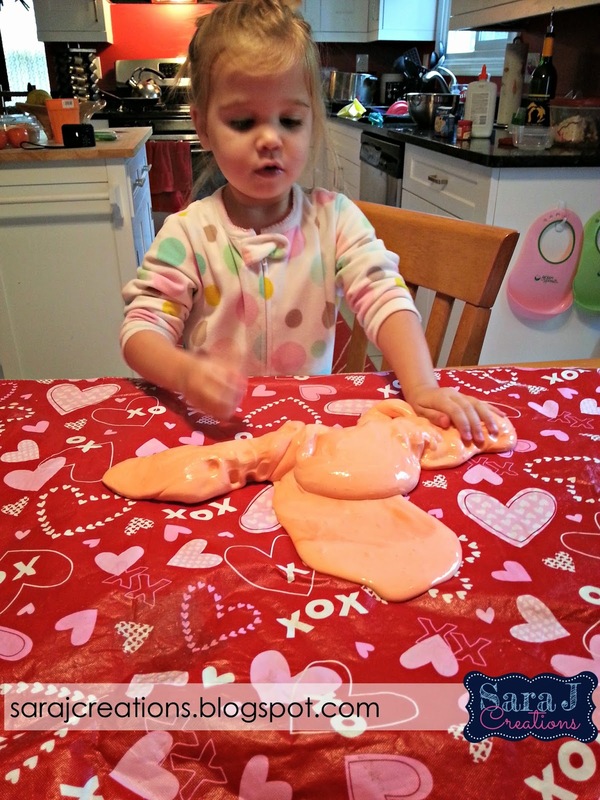 I need to get a new plastic table cloth for craft time - I'm so over this valentine's one. It ends up being in all of our crafty pictures and it is just too busy and too much red in my red kitchen. Also please ignore the mess on the counters in the background. Ha! At least my kid was happy for the day! Ours isn't bright orange. I kept adding more and more food coloring but it was still pale orange. I also didn't add nearly enough pumpkin pie spice. You can't smell it at all. I didn't measure it out. I gave a few good shakes and that was about it. It seemed like a lot but I smell the glue more than anything. I can't wait to make more of this with other scents and colors. I have to look for a cheaper alternative to Elmer's Glue or find a cheaper place to buy it than Michael's. I needed 2 cups and a bottle that size was $12 before I used a coupon I think. I probably should stock up on smaller bottles during back to school sales. Or look for cheaper dollar store glue. Other than that, everything else was stuff I had on hand. Can you share the recipe that you used to make this? I linked to it above. Where it says THIS in the first sentence, click it and it will take you to the original recipe. Since it was not my original recipe, I didn't want to publish it on my blog.